TOOLBOX: While it is true that fitness is fitness, the best path to success in racing is to match your training and fitness to the requirements of the event. Let’s take a look at some of the gravel races I’ve done in 2018 to see what’s specific about gravel competitions. 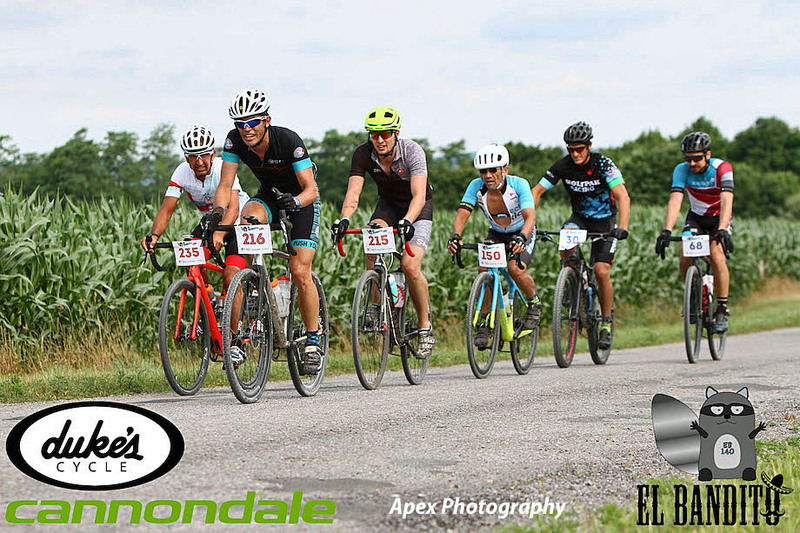 Let’s first look at the El Bandito event July 2018, a 68 km race with 1,000 m of climbing scattered pretty evenly throughout. That’s quite a bit of climbing, with no single massive climb but rather continuous rollers throughout. The first 15 min or so involved steep climbs around the ski area, a rough rocky descent, then slick singletrack trails. The final 15 min does this in reverse. In between there’s road, gravel, and sandy forest trails. The course was identical to the 2017 El Bandito, making for a nice comparator. My Xert Fitness signature was actually quite a bit higher in 2017 for all three components, at 1103 W / 21.2 kJ / 256 W for Peak Power / High Intensity Energy / Threshold Power, compared to 1023 W / 17.4 kJ / 244 W in 2018. Check out what the Xert Fitness Signature parameters mean. 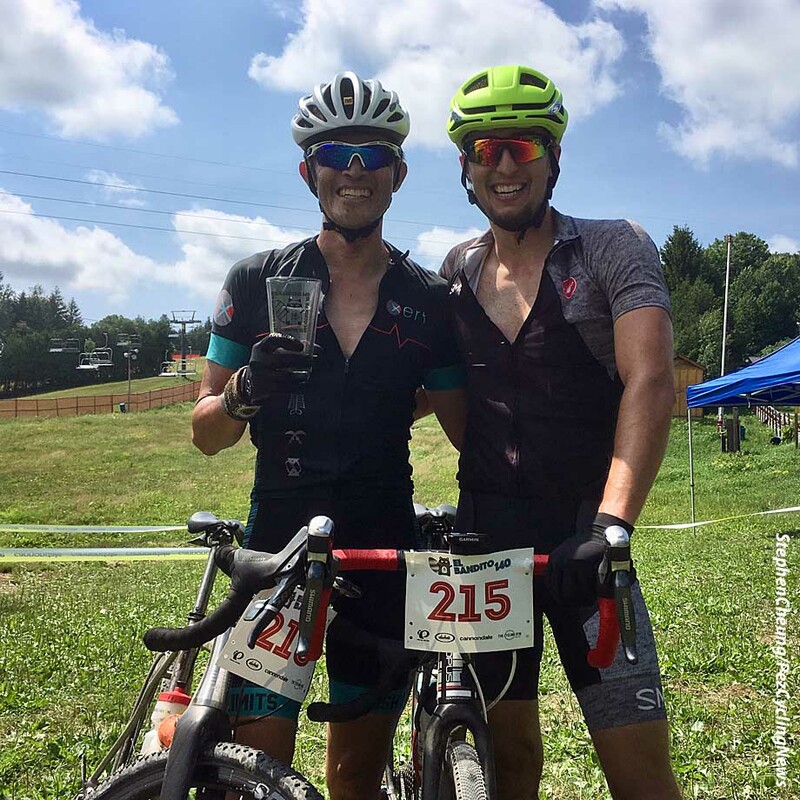 For race dynamics, in 2018 my PhD student Matt Mallette and I deliberately rode together throughout. We spent a lot of the race in a pretty well-functioning group of around 8, though Matt and I certainly did more than our fair share of the work. It was only at about the 2 h mark in the file where we took a 2 min aid station stop where we ended up riding just the two of us to the finish. By comparison, in 2017 I didn’t have any pre-ride teammates and rode almost the entire race largely solo. Despite the lower fitness in 2018, my finishing time was 6 min faster than in 2017 (removing aid stop times from both events) and the weather and wind were pretty similar. Lesson 1 from the bleedingly obvious file: no matter your fitness, it’s usually a good strategy to get a solid group of similar abilities together. You can usually cover a lot more distance in a well-matched group with relatively less effort than if you did it solo. In 2017 over the first hour, I covered 26.6 km, performing 698 kJ of work. In contrast, in 2018 I performed a similar 706 kJ of work, but covered 27.9 km instead. The corollary to the above lesson is that it pays to push yourself really hard early on in a gravel event to stay in a pack as long as you can. However, this can sometimes backfire if you push yourself far too hard early on to stick with a group that’s realistically faster than what you can handle. If this happens, you risk blowing up so hard that you end up riding the latter portion of the race slower than if you had pulled the chute and dropped off earlier. Gravel races are usually long efforts, so you have to know yourself well enough to gauge your ability to do repeated draining efforts. As I wrote previously, fitness is more than raw fitness numbers – repeatability is just as critical. In reviewing all of my gravel events raises an interesting trend. Most gravel races end up as races of attrition. You can and do push yourself fairly hard in the first 1/3 of the race but then, regardless of whether you’re solo or in a good group, you tend to become much more steady. In 2017 I rode most of the race solo. In 2018 Matt and I spent most of the day in a solid 6-rider group of equal abilities. Still, the MPA settled down about 1/3 into the race. This can be seen in how my Maximal Power Available (blue line) fluctuated throughout the early parts of the race, and then settled down after about 45 min (2017) or 60 min (2018). The same pattern emerges in other gravel races. In the 2018 Paris-Ancaster, my “A” event for early 2018 and where I had a career-best placing of 177th overall (previous was 263rd), I again spent most of the race in a very well-matched and good group. Once again, the early 1/3 or so featured MPA fluctuations, then again settled into an effort with minimal MPA drop. Lesson 2: Gravel races are long hard events where, even though you repeatedly go above your threshold power, they’re not necessarily sustained. In this way, gravel races are similar to cyclocross or mountain bike events. There are lots of bursts, but you are mainly pushing hard for brief periods, usually to clear an obstacle or short hill. Therefore, in training, the emphasis does not need to be on efforts that take you to your limit in terms of taking you to absolute fatigue. Rather, the focus should be on being able to handle repeated short bursts over and over for a very extended time. During the Build period, it’s hard to go wrong with variations of the Hour of Power type workouts, where you spend an hour at a sustained hard effort, then every couple of minutes throw in 15 s or so of hard effort and come right back to that sustained effort. While in the Peak period of training, I like to switch to microburst type efforts that have bigger swings between the on and off efforts. One of my favourites is Let the Sparks Fly, featuring alternating 20 seconds on/off. This workout takes you down to intermediate levels of fatigue, then keeps you there by dynamically adjusting the wattages of both the on and off efforts. It also simulates gravel events in that even the recovery blocks are not simply “ride easy” efforts but forces you to maintain a sustained level of fatigue. Finally, the three set enforces the repeatability concept of being able to sustain hard efforts late into a gravel event. Ride strong and have fun! A preview of Duke's Weekender in Scotland September 7-8. We ride the Niner RLT9RDO. Our Pez Goes Gravel partners include Niner Bikes, the SBT GRVL race August 18, 2019 in Steamboat Springs, Xert software, and Pioneer powermeters. 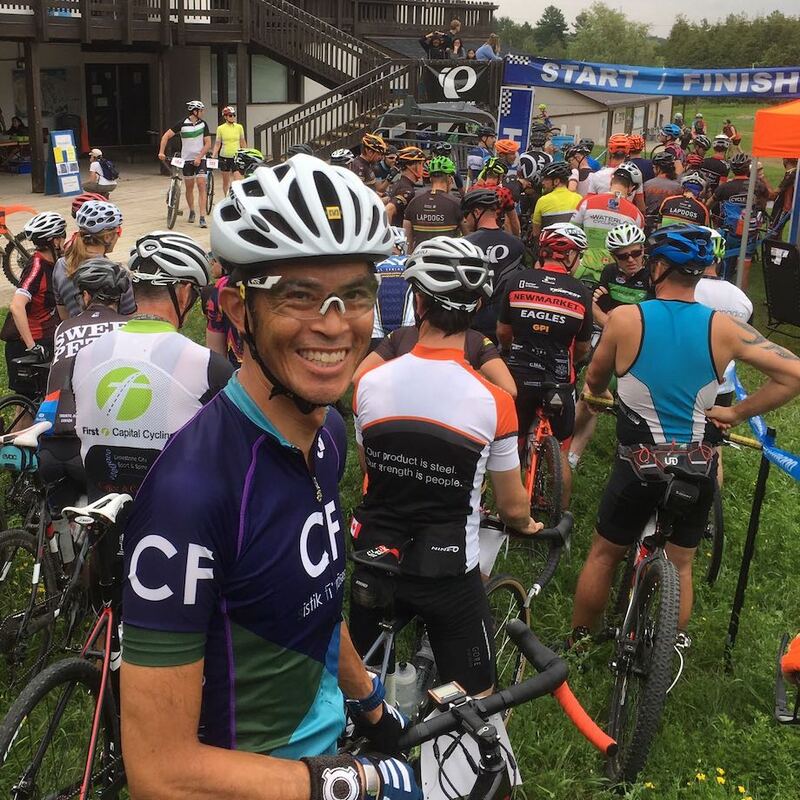 Stephen Cheung is a Canada Research Chair at Brock University, and has published over 110 scientific articles and book chapters dealing with the effects of thermal and hypoxic stress on human physiology and performance. Stephen’s Cutting-Edge Cycling, a book on the science of cycling, came out April 2012, and he is currently co-editing a followup book “Cycling Science” with Dr. Mikel Zabala from the Movistar Pro Cycling Team. Stephen can be reached for comments at [email protected] .